We are excited to present the 20th annual Recipes for the Road. Over the last two decades we have made a positive impact to help keep people safe on our roads during the holidays. Many thanks to the volunteers and sponsors that share our passion and goal of reducing alcohol-related traffic crashes and fatalities in our communities. These people and organizations have been instrumental in the book’s creation and continued success. #SoberDriverSelfie – Do your part by not driving while intoxicated. Join the fun and share a pic of you with your book! Over 20,000 full-color copies are printed and distributed each year. Enjoy flipping through this year’s Recipes for the Road book below or click here to download a PDF copy. You may also order free copies online. Thanksgiving through the New Year is a fun and festive time of year. Throughout this fall and winter season there are many celebrations, family gatherings, festivals, football pre-game tailgating and holiday parties. They are all best enjoyed when we celebrate responsibly. Please always drive safe and sober. 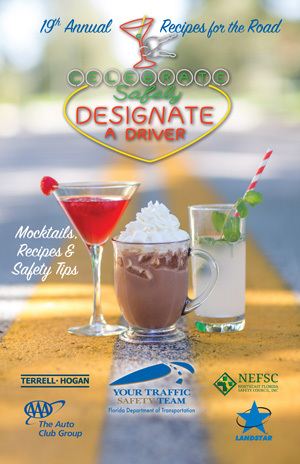 Recipes for the Road was started to help reduce drinking and driving, offering a great collection of non-alchoholic drink recipes. 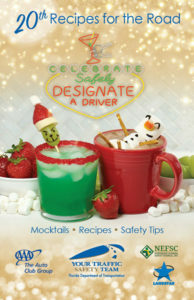 Please feel free to share and enjoy all these mocktails, food recipes, safety activity games and traffic safety tips. It’s a team effort to produce Recipes for the Road every year. We couldn’t do it without our wonderful sponsors, partners and volunteers! This year extra special thanks go out to AAA The Auto Club Group Jacksonville + PonteVedra, Landstar and Northeast Florida Safety Council. Your passion to keep our roads safe are truly appreciated. FDOT District Two got into the spirit with a “Recipes for the Road” submission contest. Look for the favorite winning non-alcoholic drinks, desserts and hors d’ oeuvre recipes from our dedicated team. Chef Tom consistently comes up with tasty, original recipes… look on page 12 for the “Easy-Peasy Pom-Lemon Squeeze” from Moxie Kitchen + Cocktails. Jax Illuminations is wonderful and if you want to see Jacksonville’s best drive thru holiday light show, see page 17 for a special discount off admission. NEW – See and share our cover drink recipe videos! Visit our Impaired Driving safety page for more resources, impaired driving crash facts and media toolkit. Click to view a PDF of our previous booklets starting from our inaugural issue in 1997! Watch our 2016 FDOT Celebrate Safely video filmed at JaxIlluminations light show!